Ottawa-Glandorf’s Richie Knowlton goes up for a shot against Spencerville’s Ben Dues during a Friday night Division III sectional final at Miller City High School. MILLER CITY — To describe Ottawa-Glandorf’s defensive pressure as smothering, might be an understatement. Right from the start of Friday’s Division III boys sectional final basketball game at Miller City, Ottawa-Glandorf’s defenders were all over Spencerville, forcing 42 turnovers on the night. O-G capitalized on nearly all of those miscues, en route to an 89-42 thumping of Spencerville. No. 1 seed O-G (22-1) will play in a district semifinal on Thursday, March 8 at Lima Senior against Paulding (13-11). Tip-off is set for 6:15 p.m.
Paulding defeated Tinora in Friday’s second sectional final at Miller City, 35-32. O-G was ranked No. 3 in the final Associated Press boys basketball poll. On Friday, O-G’s Jay Kaufman led all scorers with 27 points. The 6-foot, 5-inch Kaufman also tallied his 1,000th career point, early into the fourth quarter. Kaufman, a senior, missed the entire past football season with an injury. Kaufman said this year’s squad is committed to taking it to the next level this season. “We had a lot of guys put in a lot of work over the summer to develop their games, individually, which has made our team better as a whole,” Kaufman said. O-G had three others score in double figures on Friday. Carter Heringhaus poured in 17 points, including five 3-pointers. Heringhaus also made four steals at the defensive end. Jake Dible scored 14 points and pulled down five rebounds. Richie Knowlton came off the bench to score 11 points and pull down six boards for the Titans. O-G shot 51 percent on the night. However, it was the defensive pressure put on by the Titans that took center stage. In all, the Titans made 21 steals at the defensive end. up and down the court and get the game into the 60s or 70s. A lot of teams don’t want to play that kind of tempo. Drew Armstead led Spencerville (3-20) with 12 points. Ben Dues, a 6-4 post player, scored 10 points and had nine rebounds. Keegan Goecke scored nine points and ripped down six boards for Spencerville. Spencerville took an early 5-0 lead, on a 3-pointer by Dalton Prichard (five points), then an inside move by Dues. However, that Spencerville lead was short-lived. O-G got busy inside the paint, and its defensive pressure wreaked havoc on Spencerville’s ballhandlers, forcing seven turnovers in the first eight minutes of action. O-G raced out to a 16-8 lead by the end of the first quarter. The Titans extended their lead to 28-8 within the first 2 1/2 minutes of the second quarter, mostly off seven Spencerville turnovers. Kaufman poured in 11 points in the second stanza as O-G stretched its lead to 41-24 by the halftime break. In the first half, O-G’s pressure helped cause 23 Spencerville turnovers. 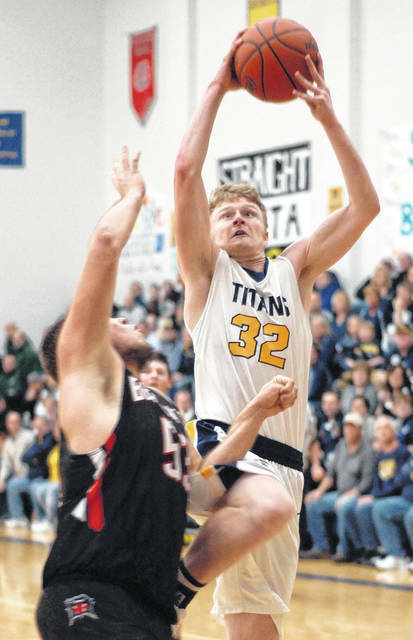 The Titans started the second half on a 14-0 run, and pushed out to a 55-24 lead, thanks to seven more Spencerville turnovers in the early going. O-G’s lead ballooned to 67-38 by the end of the third quarter. Heringhaus made three shots behind the arc in the third frame. At the 6:05 mark of the fourth quarter, Kaufman scored his 1,000th career point on an inside move, pushing the O-G lead to 75-40. Kaufman went to the bench after hitting the milestone. O-G’s pressure virtually took the game over, from the second quarter on. O-G was without the services of Owen Hiegel and Bryce Schroeder, who are both injured. Paulding slipped out with a thrilling three-point victory over Tinora in the second sectional final Friday. Paulding (13-11) will face O-G on March 8 in a district semifinal at Lima Senior. Tip-off is set for 6:15 p.m.
Jaret Miller led Paulding with eight points. Paulding led 12-9 at the end of the first quarter, and 20-18 at the halftime break. The Panthers led 27-24 at the third stop, but had to battle back down the stretch to reclaim the lead. Ryan Mohr led Tinora and all scorers with 12 points. Tinora was the No. 2 seed. This entry was tagged ottawaglandorf, paulding, Spencerville. Bookmark the permalink.